Cities: Capital: Quito (pop. 2 million). Other major cities — Guayaquil (2.28 million). Terrain: Jungle east of the Andes, a rich agricultural coastal plain west of the Andes, high-elevation valleys through the mountainous center of the country, and an archipelago of volcanic islands in the Pacific Ocean. Nationality: Noun and adjective — Ecuadorian(s). Annual population growth rate (2010 census): 1.52%. Ethnic groups: Mestizo (mixed Amerindian and Spanish) 65%, indigenous 25%, Caucasian and others 7%, African 3%. 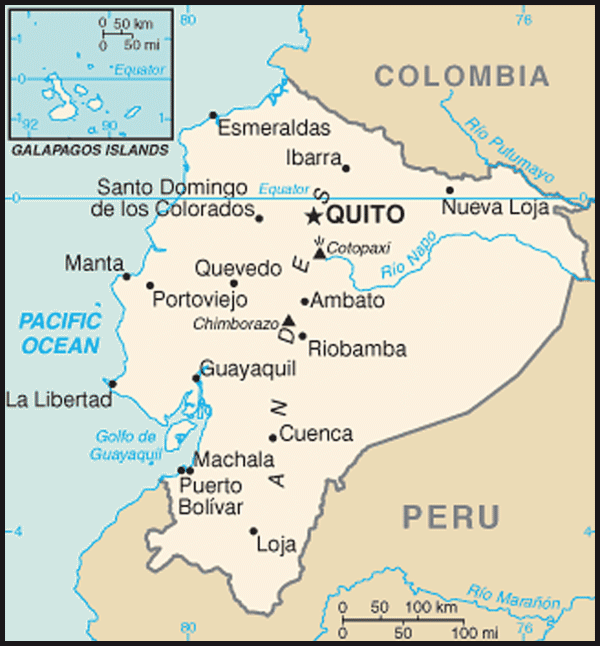 Languages: Spanish (official), indigenous languages, especially Quichua, the Ecuadorian dialect of Quechua. Quichua and Shuar are official languages of intercultural communication. Education: Years compulsory: ages 5-18. Attendance (through 6th grade) — 77% urban, 78% rural. Literacy — 97.3%. Health: Infant mortality rate: 22.1/1,000. Life expectancy — 76.62 yrs. Independence: August 10, 1809 (declared); May 24, 1822 (achieved independence from Spain). Branches: Executive: President and cabinet. Legislative — unicameral National Assembly. Judicial — National Court of Justice, Constitutional Court, Provincial Courts, ordinary civil and criminal judges, Prosecutor General's office. Electoral — National Electoral Council, Electoral Disputes Tribunal. Transparency and citizen participation — Citizen Participation Council, oversight authorities. Major political parties: Over a dozen political parties and movements; President Correa's Proud and Sovereign Fatherland (PAIS) movement is predominant. Suffrage: Universal at 16, obligatory voting for citizens 18-65 yrs. of age; optional for other eligible voters. GDP: (2010 preliminary) $56.99 billion; (2009) $52.02 billion; (2008) $54.2 billion. Real annual growth rate: (2011 forecast) 5.06%; (2010) 3.58%; (2009) 0.36%; (2008) 7.24%. 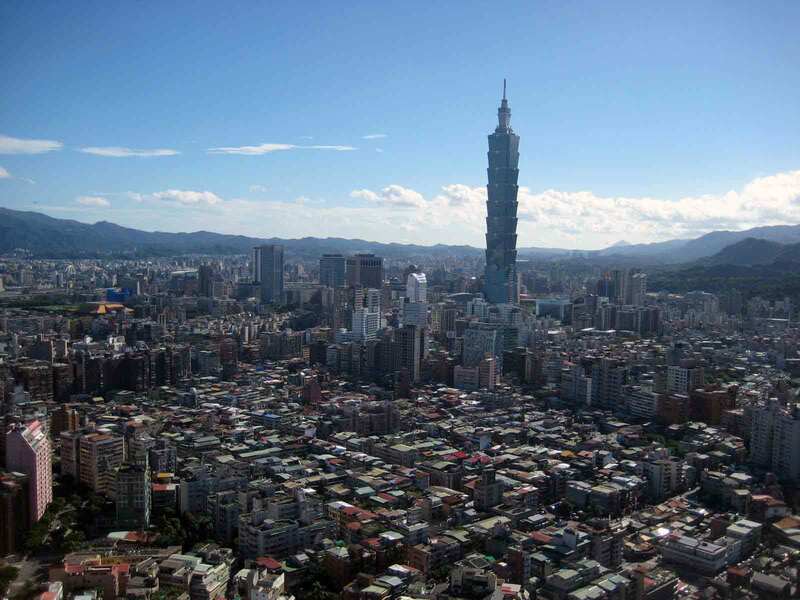 Per capita GDP: (2010 preliminary) $4,013; (2009) $3,714; (2008) $3,927. Natural resources: Petroleum, fish, shrimp, timber, gold, and copper. GDP by activity (2009): Oil and mining 14.2% (oil and natural gas extraction, and mining); commercial trade (wholesale and retail) 11.4%; construction 10.6%; manufacturing 9.2% (types — food processing, wood products, textiles, chemicals, and pharmaceuticals). Other major contributors to GDP (2008): Transportation/warehousing 6.6%; and agriculture, including seafood 6.1% (products — bananas, seafood, flowers, coffee, cacao, sugar, tropical fruits, palm oil, palm hearts, rice, corn, and livestock). Trade: Exports: $17.4 billion (2010); $13.8 billion (2009). Types — petroleum, bananas, shrimp, cacao, coffee, cut flowers, wood, canned fish. Major markets (2010) — U.S. 35%, Latin America excluding Andean Community 24%, Andean Community 18%, European Union (EU) 13%, and Asia 6%. Imports — $18.9 billion (2010); $14.1 billion (2009). Types — industrial materials, fuels and lubricants, nondurable consumer goods, industrial capital goods. Major suppliers (2010) — Latin America more than 40%, U.S. 26%, Asia 21%, and EU 9%. Ecuador's population is ethnically mixed. A large majority of the population is mestizo (mixed Amerindian-Caucasian), followed by smaller percentages of indigenous, Afro-Ecuadorian, and European descendent criollos. Although Ecuadorians were heavily concentrated in the mountainous central highland region a few decades ago, today's population is divided about equally between that area and the coastal lowlands. Migration toward cities — particularly larger cities — in all regions has increased the urban population to over 60% of the total. The tropical forest region (or Amazon region) to the east of the mountains remains sparsely populated and contains only about 3% of the population. Due to an economic crisis in the late 1990s, more than 600,000 Ecuadorians emigrated to the U.S. and Europe from 2000 to 2001. According to the 2000 U.S. census there were 323,000 persons who claimed Ecuadorian ancestry. Including undocumented migrants, it is unofficially estimated that there are approximately one million to two million Ecuadorians currently residing in the U.S.
Advanced indigenous cultures flourished in Ecuador long before the area was conquered by the Inca Empire in the 15th century. In 1534, the Spanish arrived and defeated the Inca armies, and Spanish colonists became the new elite. The indigenous population was decimated by disease in the first decades of Spanish rule — a time when the natives also were forced into the "encomienda" labor system for Spanish landlords. In 1563, Quito became the seat of a royal "audiencia" (administrative district) of Spain. A coastal-based liberal revolution in 1895 under President Eloy Alfaro reduced the power of the clergy and opened the way for capitalist development. The end of the cocoa boom produced renewed political instability and a military coup in 1925. The 1930s and 1940s were marked by populist politicians, such as five-time President Jose Velasco Ibarra. In January 1942, Ecuador signed the Rio Protocol to end a brief war with Peru the year before. Ecuador agreed to a border that conceded to Peru much of the territory Ecuador had previously claimed in the Amazon region. After World War II, a recovery in the market for agricultural commodities and the growth of the banana industry helped restore prosperity and political peace. From 1948-60, three presidents — beginning with Galo Plaza — were freely elected and completed their terms. Political turbulence returned in the 1960s, followed by a period of military dictatorship between 1972 and 1979. The 1980s and beginning of the 1990s saw a return to democracy, but instability returned by the middle of the decade. Abdala Bucaram, from the Guayaquil-based Ecuadorian Roldosista Party (PRE), won the presidency in 1996 on a platform that promised populist economic and social policies, and challenged what Bucaram termed as the power of the nation's oligarchy. During his short term of office, Bucaram's administration was severely criticized for corruption. Bucaram was deposed by the Congress in February 1997 on grounds of alleged mental incompetence. In his place, Congress named Fabian Alarcon interim president. Alarcon's presidency was endorsed by a May 1997 popular referendum. Quito mayor Jamil Mahuad of the Popular Democracy party was elected president by a narrow margin in July 1998. Mahuad concluded a historic peace agreement with Peru on October 26, 1998, but increasing economic, fiscal, and financial difficulties drove his popularity steadily lower. On January 21, 2000, during demonstrations in Quito by indigenous groups, the military and police refused to enforce public order. Demonstrators entered the congressional building and declared a three-person "junta" in charge of the country. Field-grade military officers declared their support for the concept. During a night of confusion and negotiations, President Mahuad fled the presidential palace. Vice President Gustavo Noboa took charge and Mahuad went on national television to endorse Noboa as his successor. Congress met in emergency session in Guayaquil the same day, January 22, and ratified Noboa as President of the Republic. Completing Mahuad's term, Noboa restored some stability to Ecuador. He implemented the dollarization of the economy that Mahuad had announced and obtained congressional authorization for the construction of Ecuador's second major oil pipeline, this one financed by a private consortium. Noboa turned over the government on January 15, 2003, to his successor, Lucio Gutierrez, a former army colonel who first came to public attention as a member of the short-lived "junta" of January 21, 2000. Gutierrez' campaign featured an anti-corruption and leftist, populist platform. After taking office, however, Gutierrez adopted relatively conservative fiscal policies and defensive tactics, including replacing the Supreme Court and declaring a state of emergency in the capital to combat mounting opposition. The situation came to a head on April 20, 2005, when political opponents and popular uprisings in Quito prompted Congress to strip Gutierrez of the presidency for allegedly "abandoning his post." When the military withdrew its support, Gutierrez went into temporary exile. Congress declared Vice President Alfredo Palacio the new president. A semblance of stability returned, but the Palacio administration failed to achieve congressional support for major reforms. In presidential elections in October 2006, third-time candidate Alvaro Noboa won the first round. However, Rafael Correa, Palacio's former finance minister, running on an anti-establishment reform platform and by successfully presenting himself as the "change" candidate, bested Noboa in the second round presidential runoff in November 2006. Election observers characterized the elections as generally free, fair, and transparent. Noboa's National Institutional Renovation and Action Party won the largest bloc in Congress in 2006 elections, followed by Gutierrez's Patriotic Society Party; Correa's Proud and Sovereign Fatherland (PAIS) movement did not field any congressional candidates. Traditional parties saw their congressional representation cut in half. The new Congress took office on January 5, 2007, and Correa was sworn in as President on January 15, 2007. In March 2007, the Supreme Electoral Tribunal dismissed 57 members of Congress on the grounds that they violated campaign laws. Following that, the Congress was largely deadlocked and later effectively replaced by a constituent assembly that was voted into power on September 30, 2007. The assembly, which was inaugurated on November 29, 2007, drafted a new constitution that voters approved in a referendum and that went into effect in October 2008. This new constitution is Ecuador's 20th since independence. As required under the new constitution, elections for the president, vice president, members of the National Assembly, and provincial and local offices were held in April 2009, 2 years into Correa's first term. President Correa was re-elected in the first round, taking 52% of the vote, compared to 28% for former president Lucio Gutierrez, his nearest rival. Correa's Proud and Sovereign Fatherland (PAIS) movement also won the largest legislative bloc in the new National Assembly, although not a majority. Correa has asserted that his political project, which he calls the "Citizens' Revolution," intends to search for social justice and reassert the supremacy of human labor over capital. His government has increased spending on housing, health care, and other popular social programs. The 2008 constitution provides for 4-year terms of office for the president, vice president, and members of the National Assembly. Presidents may be consecutively re-elected for an additional term. The executive branch currently includes 38 cabinet members, (including coordinating ministries with inter-governmental responsibility and national secretariats). Provincial leaders (called prefects) and councilors, mayors, city councilors, and rural parish boards are directly elected. The National Assembly elected in April 2009 replaced the interim Legislative Commission on July 31, 2009. The National Assembly is unicameral with 124 total legislators. The seven members of the Citizen Participation Council, under the transparency and social participation branch of government, were sworn in on March 18, 2010, for a 5-year term. Justices of the National Court of Justice will be selected by a Judicial Council through a merit-based process for a 9-year term, with no immediate reappointment. A special committee, composed of members selected by all branches of government, will appoint the members of the Constitutional Court to serve a 9-year term, with no reappointment. Ecuador maintains an embassy in the United States at 2535 15th Street NW, Washington, DC 20009 (tel. 202-234-7200). Consulates are located in Atlanta (404) 746-5859; Boston (781) 400-1212; Chicago (312) 338-1002/03, fax (312) 338-1004; Dallas (928) 712-9107; Houston (713) 572-8731; Jersey City (973) 344-8837; Las Vegas (702) 384-8802; Los Angeles (323) 658-5146, (323) 658-6020, fax (323) 658-1198; Miami (305) 539-8215; Minneapolis (612) 721-6468; Newark, NJ (973) 344-6900; New Haven (203) 752-1847; New York City (212) 808-0331; Queens (718) 651-8797; San Francisco (415) 982-1812; San Juan, Puerto Rico (787) 999-5226; and Tampa (561) 544-8946. A new Ecuadorian consulate is expected to open in Phoenix in 2012. Ecuador has been caught in cycles of political instability, reflecting popular disillusionment with traditional power structures and weak institutions. Ecuador's political parties have historically been small, loose organizations that depend more on populist, often charismatic, leaders to retain support than on programs or ideology. Frequent internal splits have produced great factionalism. Beginning with the 1996 election, the indigenous population abandoned its traditional policy of shunning the official political system and participated actively. The indigenous population established itself as a force in Ecuadorian politics, and participated in the Gutierrez administration before joining the opposition. Rafael Correa is the first president since the 1979 return to democracy to enjoy sustained popularity in all regions of the country and among a broad array of class and demographic groups. President Correa has criticized the traditional political parties. As a result of this criticism and their weak showings in recent elections, opposition parties are weakened and seeking ways to revive themselves. 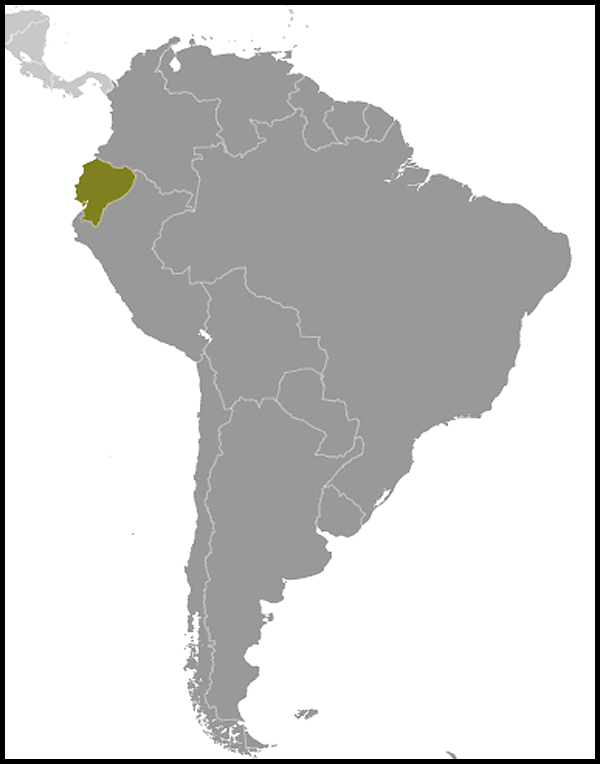 As of February 2011, President Correa's Proud and Sovereign Fatherland (PAIS) movement was the predominant political force in Ecuador, though PAIS did not hold an outright majority of seats in the National Assembly. President Correa's economic priorities include higher social spending, increased government control over strategic sectors, and ensuring a greater share of natural resource revenues for the state. However, after 4 years in office, the government's economic policies continue to evolve, creating some uncertainty for the business community. The World Economic Forum's Global Competitiveness Index rated Ecuador 105th out of 139 countries for 2010-11. The Ecuadorian economy is based on petroleum production, manufacturing primarily for the domestic market, commerce, and agricultural production for domestic consumption and export. Principal exports are petroleum, bananas, shrimp, flowers, and other primary agricultural products. In 2010, crude and refined petroleum products accounted for 56% of total export earnings. Ecuador is the world's largest exporter of bananas and plantains (about $2 billion) and a major exporter of shrimp ($828 million) and cacao ($402 million). Exports of nontraditional products such as flowers ($598 million), canned fish ($601 million), and automobiles ($375 million) have become more important in recent years. The oil sector typically accounts for 50%-60% of the country's export earnings, 15%-20% of GDP, and 30%-40% of government revenues. Oil production is primarily carried out by the government, as well as by small domestic and several large foreign companies. Oil production declined between 2006 and 2009 due to insufficient investment, before leveling out in 2010. In late 2010 and early 2011, the government renegotiated all oil concession contracts, moving from a production-sharing arrangement to service (fee) contracts. Several oil companies declined to renegotiate; those operations were devolved to the state oil company, increasing the state's share of national oil production from 62% in 2010 to roughly 71% in 2011. With oil contract renegotiations complete, public and private investment in the sector is expected to increase, along with production levels. Additional oil concessions for certain marginal fields and new large tracts in the southern part of the country are expected to be offered in mid-2011. The mineral sector has been developing slowly. However, in early 2011, government negotiations commenced with mining companies interested in moving from an exploratory phase into production. To foster diversification of Ecuador's economy, the Ecuadorian Government enacted a Production, Trade, and Investment Code in late 2010. The code is intended to promote production of higher value-added products, in particular by small and medium-sized businesses located in regions outside the major business centers of Quito and Guayaquil. Ecuador adopted the dollar as its national currency in 2000, following a major banking crisis and recession in 1999. Dollarization led to stability, which helped Ecuador achieve solid economic performance through 2006. From 2000 to 2006, growth averaged 4.9% per year, supported by high oil prices, strong domestic consumer demand, increased non-traditional exports, and growing remittances (about $3 billion in 2006) from Ecuadorians living abroad. In 2007, economic growth slowed, constrained by declining petroleum production and reduced private sector investment. In 2008, the economy recovered, posting a 7.2% real annual growth rate due to higher oil prices, increased government spending and strong domestic demand. By the end of 2008, the global financial crisis and economic downturn led to falling remittances and declining oil revenue for Ecuador. In December 2008 the government defaulted on certain debt issuances (its 2012 and 2030 Global bonds, with a total face value of approximately U.S. $3.2 billion). In June 2009, the government repurchased 91% of these bonds at a 65%-70% discount in a modified Dutch auction. Although oil prices rebounded in 2009, economic growth slowed due to a fall in internal demand resulting from the international financial crisis and reduced domestic investment. Remittances from foreign workers, Ecuador's second-largest source of external revenues, after petroleum, declined 12% due to the worsening economic conditions in the United States and Spain, the two most important origins for remittances. According to official statistics, the real annual growth rate for Ecuador's economy in 2009 was 0.36%. As the global economy began to recover in 2010, Ecuador's economy rebounded with a 3.6% growth rate. However, limited access to international financing, following the 2008 sovereign default, forced the government to reduce expenditure levels and cover a budgetary financing gap with loans from international financial institutions, funds from Ecuador's Social Security Institute, and financing from China. Ecuador has received almost $3 billion in direct financing from China since 2009. This financing has usually taken the form of contracts with the Ecuadorian Government for forward sales of oil, and often carry interest rates above those generally charged by international financial institutions, such as the World Bank. Remittances from workers abroad continued to decline in 2010, falling 7% from the 2009 level. Between 2000 and 2010, per capita income increased from $1,324 to an estimated $4,013, while the poverty rate fell from 51% to 33%. The Ecuadorian Government's official forecast for GDP growth in 2011 is 5.1%. The Ecuadorian Government's budget for 2011 totals $23.95 billion, with a $3.7 billion budget deficit and $4.95 billion financing gap. The 2011 budget is premised on an average price per barrel of Ecuadorian crude of $73.30. Higher export oil prices stemming from unrest in the Middle East are expected to provide Ecuador with substantial extra-budgetary revenue in 2011. Additional financing is expected to be in the form of loans from international financial institutions and disbursements from China for the forward sale of oil. Ecuador always has placed great emphasis on multilateral approaches to international problems. Ecuador is a member of the United Nations (and most of its specialized agencies), the Organization of American States, and many regional groups, including the Rio Group, the Latin American Energy Organization, the Union of South American Nations (UNASUR), and the Community of Andean Nations. From August 2009 to November 2010, Ecuador held the rotational presidency of UNASUR. Under the Correa administration, Ecuador has increased its efforts to strengthen and diversify its political and economic ties with countries in Latin American, Europe, and Asia. In Latin America, President Correa has traveled to Peru, Chile, Brazil, Argentina, Venezuela, Costa Rica, Panama, Uruguay, Haiti, and Cuba, for example, where his government has signed agreements to promote economic cooperation. Similarly, outside the region, Correa has visited Spain, Italy, France, China, Iran, and Russia, among other countries. In October 1998, Ecuador and Peru reached a peace agreement to settle their border differences, which had festered since the signing of the 1942 Rio Protocol. This long-running border dispute occasionally erupted into armed hostility along the undemarcated sections, with the last conflict occurring in 1995. The U.S. Government, as one of the four guarantor nations (the others were Argentina, Brazil and Chile), played an important role in bringing the conflict to an end. The peace agreement brokered by the four guarantors in February 1995 led to the cessation of hostilities and a Military Observers Mission to Ecuador-Peru (MOMEP), which monitored the zone. In addition to helping broker the peace accord, the U.S. has been active in demining the former area of conflict and supporting welfare and economic projects in the border area. The ongoing conflict in Colombia and security along the 450-mile-long northern border are important issues in Ecuador's foreign relations with Colombia. The instability of border areas and frequent encroachments of Colombian guerillas into Ecuadorian territory has led the Ecuadorian army to deploy more troops to the region. Although Ecuadorian officials have stated that Colombian guerrilla activity will not be tolerated on the Ecuadorian side of the border, guerrilla bands have been known to intimidate the local population, demanding extortion payments and practicing vigilante justice. The Correa administration is pursuing a policy known as Plan Ecuador to develop the northern border region and protect citizens from the drug threat. A Colombian military incursion into Ecuador in March 2008 caused the Government of Ecuador to break diplomatic relations for several years. However, in November 2010, Ecuador and Colombia fully re-established diplomatic relations. The United States and Ecuador have mutual interests in combating narco-trafficking and cooperating in fostering Ecuador's economic development and reducing poverty. Ties have been strengthened by the presence of an estimated one million to two million Ecuadorians living in the United States, by 250,000 U.S. citizens visiting Ecuador annually, and by approximately 50,000 U.S. citizens residing in Ecuador. More than 100 U.S. companies are doing business in Ecuador. In February 2009, the Government of Ecuador expelled two U.S. Embassy officials who administered U.S. assistance to specialized police units. A Department of State spokesperson rejected any suggestion of wrongdoing by Embassy staff. On April 5, 2011, the Government of Ecuador declared the United States Ambassador to Ecuador, Heather M. Hodges, persona non grata under Article 9 of the Vienna Convention on Diplomatic Relations. On April 7, the U.S. Government took reciprocal action, informing Ecuador's Ambassador to the United States, Luis Benigno Gallegos Chiriboga, of the decision to declare him persona non grata under Article 9(1) of the Vienna Convention. The United States and Ecuador will maintain relations at the Charge d'Affaires level for the time being. The U.S. launched a Bilateral Dialogue with Ecuador in November 2008, during which cooperation in human development and poverty reduction, economic development, commerce and investment, and migratory issues was discussed. The second plenary meeting, along with a meeting of the Ecuador-United States Trade and Investment Council, took place in November 2009, and included a discussion of security-related issues, in addition to continuing initiatives begun in the first plenary meeting. The U.S. Department of State announced April 7 that it in addition to declaring Ecuador's Ambassador Gallegos persona non grata it had also suspended the third plenary meeting of the Bilateral Dialogue, which had been tentatively scheduled for June 2011. The United States assists Ecuador's economic development directly through the U.S. Agency for International Development USAID (Peace Corps (http://ecuador.usaid.gov/index.php?lang=en), through multilateral organizations such as the Inter-American Development Bank, and through trade and technology transfers facilitated by the Foreign Commercial Service. In addition, the U.S. (http://www.peacecorps.gov/) and the State Department's Narcotic Affairs Section operate sizable programs in Ecuador. Total U.S. assistance to Ecuador amounted to over $70 million in 2010. The United States is Ecuador's principal trading partner. In 2010, Ecuador exported about $6.04 billion in products to the U.S., more than a 30% increase over 2009, and accounting for about 35% of Ecuador's total exports. For over 15 years Ecuador has benefited from duty-free entry for many of its exports under the Andean Trade Preferences Act (ATPA) and received additional trade benefits under the Andean Trade Promotion and Drug Eradication Act (ATPDEA) in 2002. The U.S. Congress approved a number of extensions of those benefits. However, the ATPDEA expired on February 12, 2011. In May 2004 Ecuador entered into negotiations for an Andean free trade agreement with the U.S., Colombia, and Peru, but negotiations between the U.S. and Ecuador lapsed in 2006. The Correa administration has stated it has no interest in negotiating a free trade agreement with the United States, but has expressed interest in negotiating a "trade for development agreement." The United States exported $5.4 billion in goods to Ecuador in 2010, a 38% increase over 2009, accounting for about 26% of Ecuador's imports. Ecuador is the 39th-largest market for U.S. exports. Major U.S. exports to Ecuador include machinery, chemicals and fertilizers, computers and electronic equipment, petroleum products, transportation equipment, and paper. The best prospects for U.S. firms are in the printing and graphic arts, construction equipment, automotive parts, cosmetics, medical equipment, telecommunications equipment, and travel and tourism sectors. U.S. firms remain competitive and successful in many sectors of the market. Although there are problems with money laundering, border controls, and illegal immigration, Ecuador shares U.S. concern over narco-trafficking and the activities of illegal armed groups. The government has maintained Ecuador virtually free of coca production since the mid-1980s, and is working to combat money laundering and the transshipment of drugs and chemicals essential to the processing of cocaine (with U.S. support). Ecuador also gives priority to combating child labor and trafficking in persons. The Financial Action Task Force (FATF) and Financial Action Task Force of South America are evaluating a new money laundering law enacted by Ecuador in 2010. Meanwhile, Ecuador remains on FATF's list of countries that have strategic anti-money laundering and counterterrorism finance deficiencies they are working to address. Ecuador and the U.S. agreed in 1999 to a 10-year arrangement whereby U.S. military surveillance aircraft could use the airbase at Manta, Ecuador, as a Forward Operating Location (FOL) to detect drug-trafficking flights and drug-laden fishing vessels in the region. The Ecuadorian Government informed the United States in July 2008 that it would not renew the lease for the Forward Operating Location when it expired in November 2009. The U.S. ceased these counternarcotics flights in July and departed the FOL in September 2009. Ecuador claims a 320-kilometer-wide (200-mi.) territorial sea. The United States, in contrast, claims a 12-mile boundary and jurisdiction for the management of coastal fisheries up to 320 kilometers (200 mi.) from its coast, but excludes highly migratory species. Although successive Ecuadorian governments have declared a willingness to explore possible solutions to this issue, the U.S. and Ecuador have yet to resolve fundamental differences concerning the recognition of territorial waters.